Location: On the still-open Harrogate to York line. At level crossing on lane off A59, about 400yd from the junction. Railway staff cottages extant. Platforms demolished. Notes: Wilstrop Siding was one of the stations on the railway between York and Harrogate. The line is still open and thriving although it was on Beeching’s closure list. The western end of this route originated on 21 July 1845 when the Leeds & Thirsk Railway (L&T) was authorised to construct a branch from its planned main line at Starbeck (where it skirted the eastern fringe of Harrogate) to Knaresborough. The East & West Yorkshire Junction Railway (EWYJ) – described by Hoole (1974) as a protégé of George Hudson’s York & North Midland Railway (YNM) – was authorised on 16 July 1846 to build from York to Knaresborough. The L&T seemed to be showing excessive interest in the EWYJ in 1847, but Hudson’s influence won the day. At the opening the line from Skelton Junction, where the new route diverged from the Hudson’s York, Newcastle & Berwick Railway, the latter company provided the motive power. The western terminus at its opening on 30 October 1848 was at Hay Park Lane, about a mile east of Knaresborough. This temporary measure was necessary because the L&T’s viaduct over the River Nidd in Knaresborough collapsed on 11 March 1848 as it neared completion. The successfully completed structure was notable for its castellated piers complementing the ruins of the nearby castle. On 21 July 1851 the Leeds Northern Railway (renamed from L&T on 3 July) branch from Starbeck opened to meet the line from York at Knaresborough. What is now Starbeck station was identified in Bradshaw by various names – including Harrogate, Harrogate & Knaresborough, High Harrogate and Harrogate High – until it settled down to be Starbeck in 1857. Trains on the Leeds and Wetherby lines used another Harrogate station (the terminus usually suffixed ‘Brunswick’ in modern literature to distinguish it from the present station which replaced it in 1862). From 1851 the EWYJ operated its own motive power with the assistance of E B Wilson & Co, locomotive builders of Leeds. On 28 May 1852 the EWYJ was absorbed into the YNM company; the L&T had been renamed the Leeds Northern Railway (LN) on 3 July 1851; and both the YNM and LN companies became part of the newly-formed North Eastern Railway in 1854. The present Harrogate station opened on 1 August 1862; it became the western terminus of the line from York and replaced the Brunswick terminus, as mentioned above. All of the intermediate stations between York and Harrogate were in operation by 1850, with the exception of Wilstrop Siding which first appeared in Bradshaw in June 1865. The OS 1850 map shows only ‘Gates’, but apparently no gatehouse, on the lane from what is now the A59 to Wilstrop Hall. Crossing keepers’ accommodation was eventually provided, and a goods siding was installed on the down side, south-east of the level crossing, complete with a small shelter over the track. The up passenger platform was built south-east and the down north-west of the crossing in a ‘staggered’ layout; both platforms were relatively narrow and constructed of timber with cinder infill. 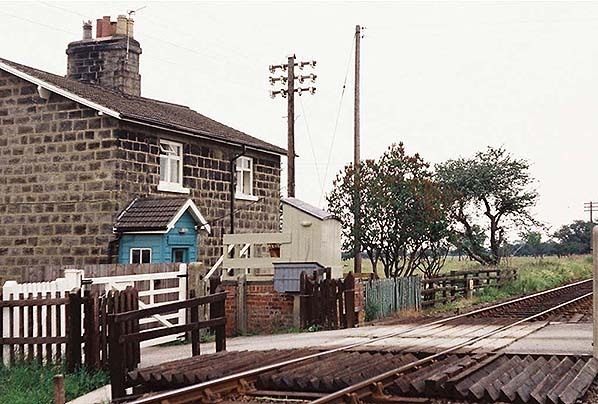 Wilstrop Siding station was one of a few on the North Eastern Railway which were given a restricted service of a train each way on one day a week to enable local people, particularly the railway staff living at the crossing, to get to the local market. 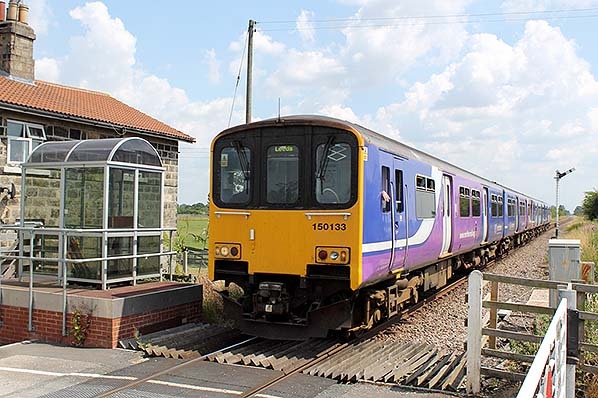 Other stations with a similar service included West Rounton Gates (between Northallerton and Stockton), Mickley (between Newcastle and Hexham) and, for some of its life, Smeafield (between Chathill and Berwick). As far as can be ascertained, trains only ever called on Saturdays at Wilstrop Siding to enable passengers to travel to the York weekly market; a morning train conveyed passengers to the city and they returned on an afternoon train. North Eastern Railway and Reid’s timetables seem to have relegated Wilstrop Siding to a footnote, but Bradshaw practice was to include it in the timetable-proper, despite its paltry service. Whichever format was used, the precise time of departure was not given. In the July 1896 NER timetable, on Saturday only, the up train called c11.48 am ‘for York market passengers’, and the return train arrived at about 5.23 pm. In October 1912 the morning train called a little earlier, at about 11.27 am, but the afternoon return was much earlier, at c3.33 pm, allowing much less time to enjoy the thrills of the market. June 1920 Reid’s timetable shows c11.27 am and c3.33pm calls - as ever, on Saturday only. Whilst the NER statistics are available for most of its stations, giving local population figures and numbers of tickets issued in 1911, no such information appears to have been collected for Wilstrop Siding. Details on goods handled have also not been found. The only large scale OS plans published when the station was open to passengers (1892 and 1909) show no buildings on either platform. If the principal users of the service lived in the crossing cottages next to the York-bound platform, they would not have had reason to wait for any length of time for the train; the down platform was used only for alighting from trains, so once again there would be no reason to provide a shelter. A photograph c1930 of the station shows no lighting on the platforms, and in the later years it seems that the two trains called in daylight hours, whatever time of year it was, so lighting was unnecessary. Passenger trains continued to call at Wilstrop Siding into the LNER era. However it was last used on 25 April 1931 and according to Clinker’s Register the station was closed a few days later, on 1 May. The timber-and-cinder platforms could be readily dismantled, and nothing remained of them by the mid 1960s. Goods services survived well into British Railways days, ending on 4 May 1964. Operating economies were exercised by British Rail in the 1970s. 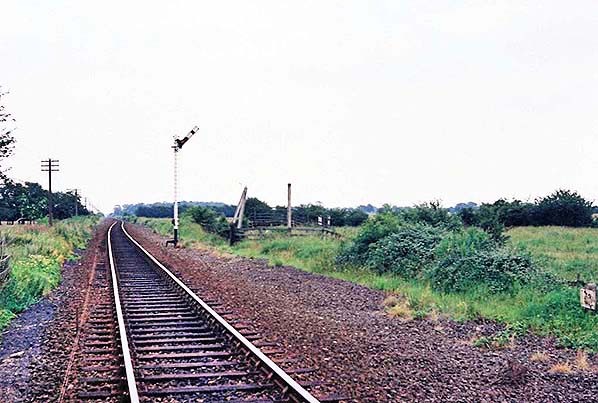 Single-line working commenced on 4 June 1972 between Poppleton and Hammerton; the up line was removed through Wilstrop Siding station by May 1973. The section between Cattal and Knaresborough was similarly downgraded on 16 December 1973 with the redundant track being recovered by 3 March 1974. One of the curiosities of the York – Harrogate line is that in 2016 it remains a stronghold of semaphore signals and manually operated, attended level crossing gates, as at Wilstrop Siding. There are probably several factors at work to explain this. At present there is no problem with availability of staff for these duties. The equipment installed when track-singling was carried out in the 1970s is still serviceable, and with restoration of double track and even electrification in prospect it would make little sense to automate the crossings and train control until it is clear how and when the route will be upgraded – which surely will happen soon. Wilstrop crossing is still attended in the daytime, and the crossing cottage is in use by the gatekeeper. The public road from the north ends at the gates, although a right of way on foot continues over and beyond the crossing. At present there are only seven users authorised to drive over the crossing – as well as approved people visiting the properties south of the crossing. A sign instructs motorists to ring to have the gates opened, but at night, when unattended, the motorists open the gates themselves. The gates open outwards so as not to obstruct the railway track. In addition to a standard portacabin (with a BR style ‘Wilstrop’ nameplate) there is a modern metal-and-glass booth to house the lever frame. Once considered expendable, the York-Harrogate route has gone from strength to strength with an hourly weekday service operating to and from Leeds and stopping at all stations; a further hourly service runs between Knaresborough, Harrogate and Leeds, and there are also frequent Sunday trains. On a number of recent journeys between Harrogate and York the author has noted that the trains are well-used, sometimes with standing room only, even outside the rush hour. 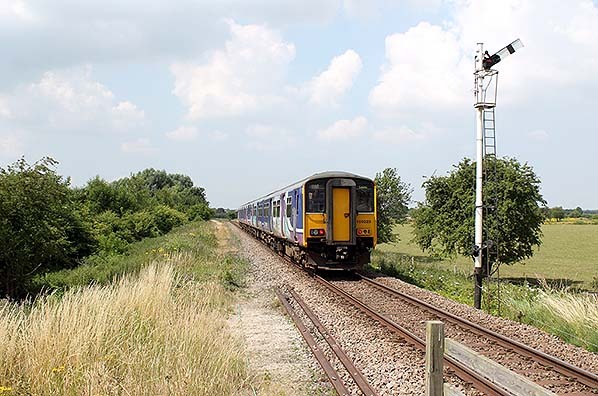 Organised holidays tours based in Harrogate but visiting York for the day provide many passengers for the line during the summer half of the year. Whatever the future holds for the York-Harrogate line, there can be no justification for reopening a station at Wilstrop. Young, Alan Lost stations of Yorkshire Part 1: The West Riding (Silver Link Publishing Ltd, 2015). 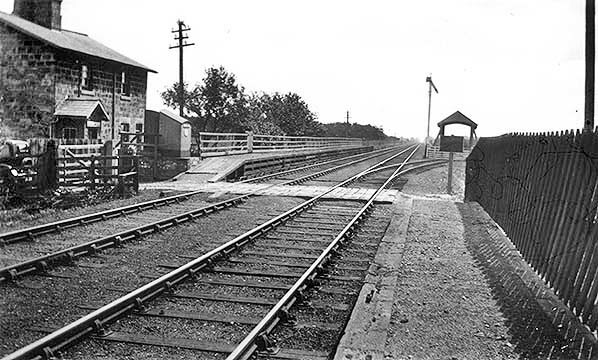 Wilstrop Siding station, looking south-east from the down (Harrogate-bound) platform c1930. The up platform is on the far side of the crossing, adjacent to the railway staff cottages. An NER nameplate ‘Wilstrop Siding’ can be seen affixed to the porch. The shed with the curved roof, just beyond the cottages, encloses the lever frame. The platforms are constructed of timber with infill, and their narrowness will be noted. No shelters or lighting are provided for passengers. Just beyond the crossing the goods siding diverges to the right. A shelter has been built over the siding. The passenger platforms of Wilstrop Siding station can be seen staggered on either side of the level crossing, the up platform being to the south-east and adjacent to the railway staff cottages. No buildings are shown on the platforms. The goods siding is also south-east of the crossing and is on the down side. Earlier maps show the siding was longer than shown here passing through the wooden shed. 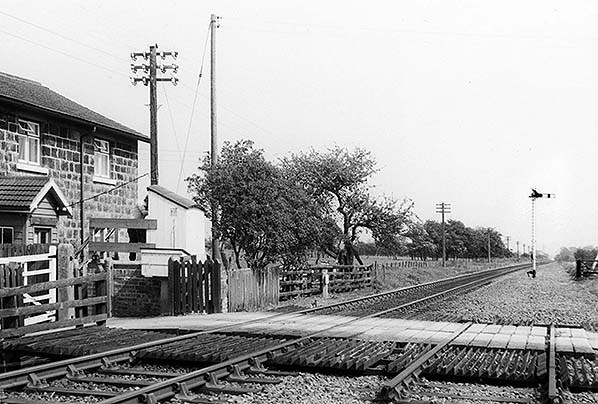 The level crossing and railway staff cottages at Wilstrop Siding are seen in May 1973, looking east. The up platform used to be on the far side of the railway track, and the down platform was behind the photographer. Until 1972 the route was double track. The lever frame from which the gates are locked and signals are operated is in the hut beside the telegraph pole. 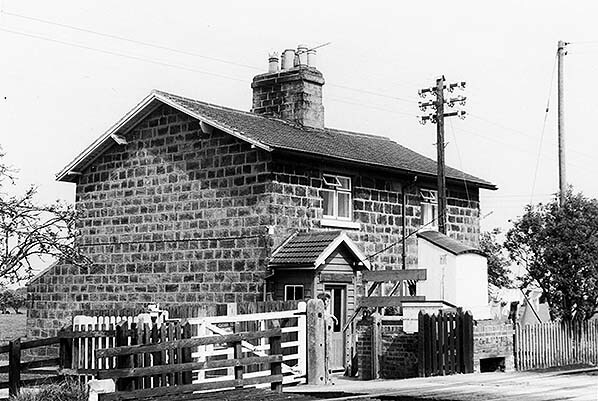 The railway cottages at Wilstrop Siding, seen in May 1973; the figure seen by the door is possibly the crossing keeper. The lever frame from which the gates are locked and signals are operated is visible behind the hut which partly shelters it. The level crossing over a narrow lane is in the foreground. 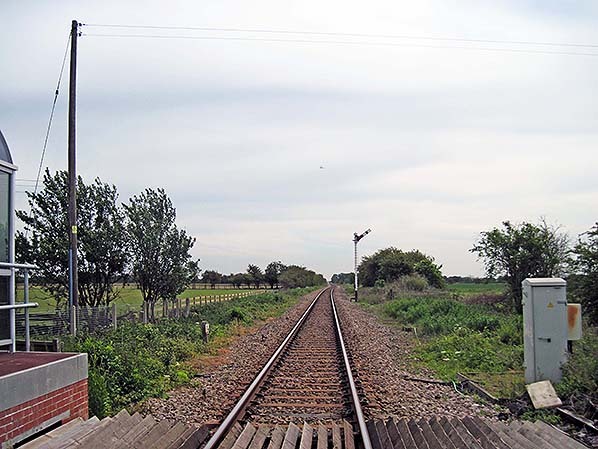 Looking east from the level crossing at Wilstrop Siding after the railway was singled between Poppleton and Hammerton. The up platform was formerly to the left of the railway track and the goods siding was beyond and to the right of the signal which is in the ‘off’ position indicating that a train is expected from the York direction; the signal, which protects Wilstrop level crossing is operated from a frame behind the photographer. The site of the goods siding is clearly visible as is part of the wooden shed that straddled the siding (c1930s picture above). The siding closed in 1964. The railway cottages at Wilstrop Siding, looking east over the level crossing. The lever frame is on the brick plinth, partly protected by the timber shelter. Looking east from the level crossing at Wilstrop Siding in May 2010. The route through this point was double track until 1972. The goods siding that gave its name to the station was formerly ahead and to the right. On the extreme left is the brick plinth and glazed shelter for the lever frame. The home signal ahead is operated from this frame; it is in the 'off' position indicating that a train from the York direction is expected. The staff cottages at Wilstrop Siding are in use, when seen on this photograph in July 2013, and the crossing is still attended during the day. The frame is enclosed within the metal-and-glass booth on brick foundations. The Harrogate-bound Class 150 DMU No.150 133 is passing the site of the station. The site of the long-demolished up platform was on the far side of the track, obscured by the train. The line was singled in 1972-73. Looking north-west from the level crossing at Wilstrop Siding in July 2013 as a DMU (150 223) on the 13.11 working from York disappears towards Harrogate and Leeds. The long-demolished down platform of this station was immediately ahead of the camera. 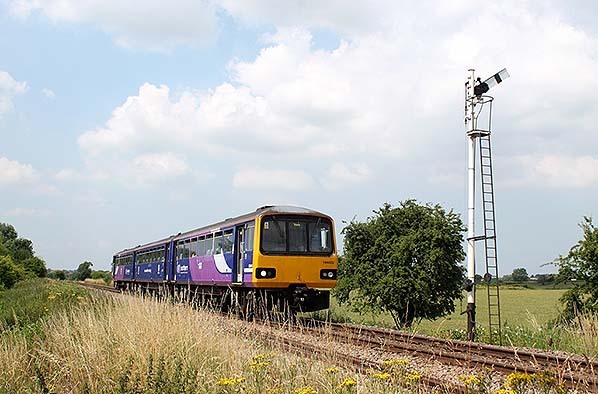 DMU 144 022 is operating the 12.29 Leeds to York in July 2013 and is passing the site of the down platform at Wilstrop Siding, formerly to the left of the track. The view is westward.